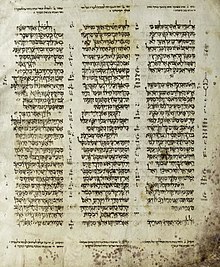 The Aleppo Codex is the oldest known Hebrew manuscript that includes most of the Old Testament; it dates from about 930CE. From these few test-passages we may conclude that the statement assigning this Coded to Ben Asher is a fabrication, merely introduced to enhance the value of the same. According to this facsimile the codex comes from Germany and was written in the fourteenth century, therefore it is worthless for research purposes. One usually assumes that the book on which Maimonides relied was the Aleppo Codex. Ostensibly, this seems likely enough. Yet I permit myself to doubt it for technical reasons which this is not the place to set out in detail. No manuscript of the Hebrew Bible, apart from those discovered among the Dead Sea Scrolls, has been the subject of so heated a discussion as our Codex. In these matters we relied upon the codex, now in Egypt, which contains the twenty-four books of Scripture and which had been in Jerusalem for several years. It was used as the standard text in the correction of books. Everyone relied on it, because it had been corrected by Ben Asher himself who worked on its details closely for many years and corrected it many times whenever it was being copied. Moses Maimonides (quoted in Emanuel Tov, Textual Criticism of the Hebrew Bible [Minneapolis: Fortress Press, 2001], p. 46). (Umberto) Cassuto has not any doubt that the Aleppo codex is a real Ben Asher codex and he agrees with me that it has to be regarded as one of the four codices which are to be taken as the chief basis for an edition of the Ben Asher text of the Hebrew Bible. There is no doubt that in its closeness to the tradition ascribed to ben Asher, and also in its accuracy and consistency, this manuscript must be considered superior to all other Tiberian manuscripts known to us. It is, therefore, the most important representative of the standard Tiberian tradition. Damage to the Aleppo Codex (Halab), the earliest Hebrew Old Testament, has been found to have been caused by a member of the genus Aspergillus, rather than fire. The Aleppo Codex is indeed the book upon which Maimonides relied, and the ancient tradition regarding its lineage is confirmed. The pointing was done with special care, and it was regarded as a model codex; it was to be used liturgically only on the feasts of Passover, Weeks, and Tabernacles, and otherwise used only for consultation by scholars to settle matters of doubt, and not for study. This page was last edited on 12 July 2014, at 22:35.